``Amy and I named Alpha Phi Omega as a beneficiary of my insurance policy because we wanted to give back to the organization that has given us so much. It was through APO that we made most of the meaningful friendships we have today and where I made contacts that led me to my present occupation. It's also the common interest that acted as a conduit for Amy and I to meet and fall in love. Becoming members of the Blue & Gold Society is but a kind gesture compared to the happiness, friendships and memories the Fraternity has and continues to provide us.`` Tom Westfall, Alpha Gamma '05, Amy (Pivovarnik) Westfall, Alpha Gamma '01. 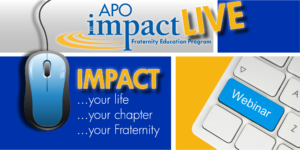 The purpose of the Blue & Gold Society is to recognize the generous investment in the Alpha Phi Omega Endowment, Inc., made by members of the Fraternity. Their commitment in the future will provide a continuing source of income to enable the Fraternity to achieve its strategic goals in growth, programs and membership. These gifts from the assets of generous brothers will strengthen the Fraternity’s values to Leadership, Friendship and Service for decades to come. Our most sincere gratitude goes to these brothers who are committed to the future of the Fraternity. Gift types are divided into two classes. Outright gifts during life of cash or other assets will provide an immediate source of income to the Endowment. Deferred gifts that are made as a part of an estate plan for transfer to the Endowment after death. Or gifts that provide a source of income to the Endowment at a future date, but during the donors life benefit the donor by creating a life income or other benefit. All donors gifts of any size will be recognized in a fall edition of the Torch & Trefoil and will receive a letter of gratitude and acknowledgment in the year of the gift from the Executive Director. For more information on the Blue & Gold Society, please contact National Executive Director Bob London at 816-373-8667 or email [email protected].